Researchers at Johns Hopkins report they have identified a protein that enables a toxic natural aggregate to spread from cell to cell in a mammal’s brain — and a way to block that protein’s action. Their study in mice and cultured cells suggests that an immunotherapy already in clinical trials as a cancer therapy should also be tested as a way to slow the progress of Parkinson’s disease, the researchers say. synuclein aggregates in the brain cells of mice with (top) and without (bottom) the LAG3 protein. Ted Dawson, M.D., Ph.D., director of the Institute for Cell Engineering at the Johns Hopkins University School of Medicine and one of the study’s leaders, says the new findings hinge on how aggregates of α-synuclein protein enter brain cells. 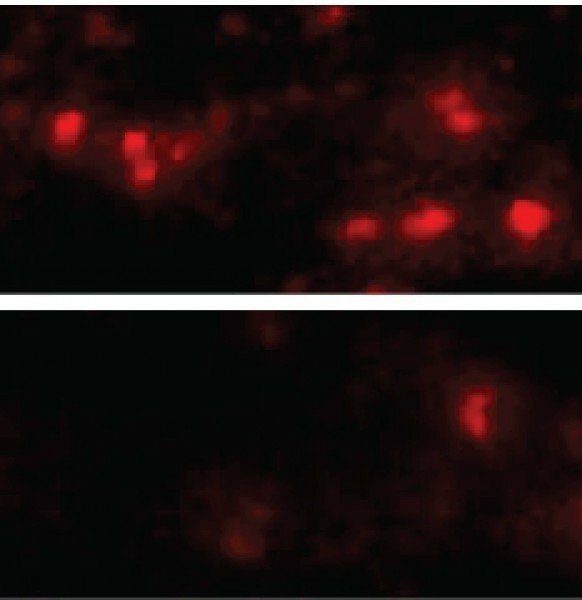 Abnormal clumps of α-synuclein protein are often found in autopsies of people with Parkinson’s disease and are thought to cause the death of dopamine-producing brain cells. A few years ago, Dawson says, a researcher at Goethe University in Germany published evidence for a novel theory that Parkinson’s disease progresses as α-synuclein aggregates spread from brain cell to brain cell, inducing previously normal α-synuclein protein to aggregate, and gradually move from the “lower” brain structures responsible for movement and basic functions to “higher” areas associated with processes like memory and reasoning. “There was a lot of skepticism, but then other labs showed α-synuclein might spread from cell to cell,” Dawson says. Intrigued, his research group began working with those of Valina Dawson, Ph.D., professor of neurology, and Han Seok Ko, Ph.D., assistant professor of neurology, to investigate how the aggregates enter cells. The researchers knew they were looking for a certain kind of protein called a transmembrane receptor, which is found on the outside of a cell and works like a lock in a door, admitting only proteins with the right “key.” They first found a type of cells α-synuclein aggregates could not enter — a line of human brain cancer cells grown in the laboratory. The next step was to add genes for transmembrane receptors one by one to the cells and see whether any of them allowed the aggregates in. Three of the proteins did, and one, LAG3, had a heavy preference for latching on to α-synuclein aggregates over nonclumped α-synuclein. The team next bred mice that lacked the gene for LAG3 and injected them with α-synuclein aggregates. “Typical mice develop Parkinson’s-like symptoms soon after they’re injected, and within six months, half of their dopamine-making neurons die,” Dawson says. “But mice without LAG3 were almost completely protected from these effects.” Antibodies that blocked LAG3 had similar protective effects in cultured neurons, the researchers found. “We were excited to find not only how α-synuclein aggregates spread through the brain, but also that their progress could be blocked by existing antibodies,” says Xiaobo Mao, Ph.D., a research associate in Dawson’s laboratory and first author on the study. Dawson notes that antibodies targeting LAG3 are already in clinical trials to test whether they can beef up the immune system during chemotherapy. If those trials demonstrate the drugs’ safety, the process of testing them as therapeutics for Parkinsons’ disease might be sped up, he says. For now, the research team is planning to continue testing LAG3 antibodies in mice and to further explore LAG3’s function. More than 1 million people in the United States live with Parkinson’s disease. The disease gradually strips away motor abilities, leaving people with a slow and awkward gait, rigid limbs, tremors, shuffling and a lack of balance. Its causes are not well-understood. Web Source: Johns Hopkins Medicine.